Cloud solutions in Germany, certified and future-proof, acc. EU DSGVO. All our cloud offers are realized in Germany in compliance with the strict German and European data protection requirements such as the EU DSGV. Benefit from the reliability of a cluster and the flexibility of modern cloud solutions with our supervised cloud server systems. 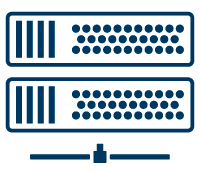 With our ISO 27001 and ISO 9001 certified managed hosting you get state-of-the-art systems that can be flexibly adapted to your requirements without having to invest in expensive infrastructure or your own personnel. Of course, our cloud servers meet the requirements of the new EU-DSGV data protection regulation. We manage your cloud infrastructure incl. Connection, network, hardware, cloud stack, redundant storage 24/7 including comprehensive incident management. Our solutions are compliant with data protection in Germany at high-security data centers in Frankfurt am Main (or your own DC) and secured by our ISO27001 and ISO9001 certified management process. Comprehensive auditing by auditors acc. IDW PS 951 Type 2 (comparable to SOC2) ensures compliance with requirements and compliance, even for demanding projects and customers. We handle the operation of IT infrastructure, including all administrative work, supervision and 24/7 incident management. As Platform as a Service (PaaS) we provide u.a. LAMP and Tomcat systems, database cluster MariaDB, PostGreSQL, and of course pure Linux, BSD and Windows systems ready. We offer SaaS for common software such as JIRA, Confluence, TYPO3, RT as well as for the operation of your own software and applications. Benefit from our experience in the comprehensive certification and auditing and compliance in data protection (EU-DSGV). Many well-known software companies use our experience for the realization of demanding SaaS offers for their customers. Contact us.